Virtual reality, with capabilities that go far beyond gaming, will make its debut into workplaces, and already has in some instances. The sheer idea of being able to teleport employees (through VR) to the outside world of the office a thousand miles away may help boost employees’ productivity while reducing their stress level. Organizations across the world are finding it increasingly tempting to embrace open office culture and leverage new age messaging tools which can reinvent collaboration and streamline dispersed business operations. Smart technologies such as Virtual reality are making a transition from our personal lives to workplaces. These technologies are not only changing the way we meet and collaborate, but it is also changing the physical environment in which we work as well. A workforce study titled ‘Future Workforce Global Study’ by Dell shows that employees, especially millennials, expect to be working in a smart office in the near future since many of the employees do not find their current office smart enough. The findings echo in another study by Universum - an employer branding research company based in Singapore which says, 49% of Gen Z in Singapore believe that VR will revolutionize work. Virtual reality is one such technology which can help make workplace smart by helping to attract the best talent and making them more productive at work. The sheer idea of being able to teleport employees to the outside world of the office a thousand miles away may help boost employees’ productivity while reducing their stress level. This comes at a time when the world is talking about SpaceVR –a platform for creating virtual space tourism, which is going to be the world’s first virtual reality camera satellite, into space. Thanks to the tech advances made in virtual, augmented, and now mixed reality space. The headsets from the likes of Microsoft, Samsung and Oculus made the world more fun. Virtual reality, which has created a storm in the gaming and entertainment industry, has capabilities to transform communication and collaboration by enabling workforce sitting in discrete locations meet together in one virtual room. While the technology has created a storm in the gaming and entertainment industry, the real power of virtual reality is how they can change the communication and collaboration thus enabling workforce sitting in discrete locations to meet together in one virtual room. Lynne Roeder, Managing Director of Hays, a global professional recruiting group based in Singapore, says, “The number of possibilities virtual reality creates is astounding. Once we start exploring the many ways it could be implemented, it could have a big impact on the world of work". One technology that goes hand in hand is augmented reality which brings with it a host of application areas such as training. And so is mixed reality which Microsoft is baking its support for. All these pieces of technologies put together can help workforce move between realities to be able to work seamlessly as one unified team. Today’s workforce defines the future workplace no longer as a site of ‘containment’ but a place where they can meet, learn and share their experiences and collaborate ideas. Workplace infrastructure has come out to be one of the key reasons to retain the smart employees and leaders should definitely not overlook this. In terms of VR at workspaces, telecommuting and telepresence will be of great use to professionals, as it allows the flexibility to work from anywhere and conduct virtual meetings without traveling from point A to B, saving on time and money. The use of VR extends to all departments of a company –from HR to conduct training, to engineers and designers who can design and test using VR simulators. 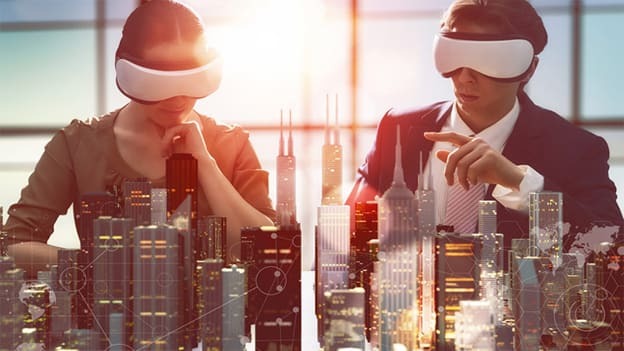 While VR is going to take time to become fully realized in the enterprise, an increasing number of solution providers are focused on the virtual workplace and innovations in this space are growing at a rapid pace, according to Gartner. Companies like Microsoft and Cisco have already introduced products and now Oculus is throwing their hat in the ring, along with their parent company Facebook via their Oculus for Business, Oculus Desktop, and Facebook Spaces initiatives. “There are many technologies, processes, and cultural changes that will need to occur in order for the virtual workplace to truly come to fruition, but forward-looking organizations should be tracking the advances that are being made in this area,” says Gartner. “When it comes to enterprise or workplace, we are still at the stage where we are using old traditional products which have a very bad experience and user interface. But I can see a change where enterprises are spending plenty of money on employee experience, benefits, learning, and training, says Sarthak Saini, Chief Product Officer, Leena AI, an HR Tech startup. There are innumerable applications of VR today, according to Merxius, a VR startup, as it explained at a recent TEDx Bangalore Salon, in partnership with Dell. It is being extensively used for training in the fields of engineering, manufacturing, and healthcare. So much so that doctors are testing complex surgeries in VR, before actually performing them. For designers, designs first done on VR will give customers a feel of the set-up, before it is implemented. In education, a solar system had only existed as a picture in textbooks, but with VR one can get a touch and feel, experience its magnitude as if you are actually there. “The latest VR techniques can assist the employees with more realistic expectations about the job and their responsibilities. This reduces the time of adjustment and transition to the role, making them much more productive and adding an element of fun to the routine work,” says Indrajit Belgundi, General Manager, Client Solutions Group, Dell India. Businesses these days have adopted these techniques to help employees feel more invested and motivated in their work. Brands have already discovered the benefits of gamifying their mobile apps or products, increasing user engagement and brand loyalty. For instance, customer service training requires teaching employees how to impact, retain and understand customer requirements as well as the use of greetings, body language, appropriate tone of voice and the best way to deal with customer complaints. These skill sets can be quite difficult to hone if the learning is hypothetical. With virtual reality, however, employers are able to simulate real-life situations, adds Indrajit. “When it comes to Learning and training, I see a huge scope for virtual reality. In manufacturing, pharma or consumer good companies, where employees need information on their fingertips, virtual reality can be of big use,” says Saini. Let’s take an example, suppose a sales employee goes to a customer for showcasing a product. Now, instead of showing long PPTs or demo videos, they can showcase the live product with the help of virtual reality. In a way, it is decreases the time of sales cycle, argues Saini. Virtual reality can be of great use in training of the new joiners, instead of lectures, they can see the details of products using VR. Furthermore, by using VR during the training of new hires, you can also help them have much more realistic expectations about the job they will perform. This reduces the time of adjustment and transition to the role, making them much more productive in the long run. Plus, it’s fun. There are already plenty of tools that help businesses work with freelancers or even employees located at a distance. Managers tend to be content with conversations over Skype or Slack and think that they make real-time collaboration as real as it can get. But when VR also comes into the equation, the previously inevitable time waste is cut down drastically, Saini concludes. Despite the significant hype and investment surrounding these technologies, the VR market is still in its infancy and unsettled even among those driving innovation. To gain adoption of VR, businesses need to create a workplace culture that sees the utilization of new technologies as a means to an end—that end being improving the company and facilitating individual employee success. As outlined in Dell Technologies' REALIZE 2030: The Next Era of Human-Machine Partnerships, it’s estimated that 85% of the jobs that will exist in 2030 haven’t been invented yet and the skills they’ll require haven’t been scoped out. “To get ahead, people will need to learn-in-the-moment using new technologies such as VR - making the ability to gain new knowledge more valuable than the knowledge itself,” argues Indrajit. Price and content will define the maturity of VR in the workplace. From a workplace training point of view, cost and difficulty in creating VR content are critical parameters. Organizations will require making a significant investment to VR to make it a reality in offices. VR, like any other connected technology, also comes with cybersecurity challenges, feel experts. The challenges will be interesting - to see how work culture and patterns of rewards and incentive will change in the future. “When we innovate and adopt new technologies, we should ask ourselves why we are doing it and what impact it will have on our employees, customers and the greater society,” concludes Indrajit. To learn more on how organizations are gearing up to leverage Virtual Reality in workplace and overcome challenges of implementations, join us for People Matters TechHR Conference on 28th February 2019 at Marina Bay Sands, Singapore. Register Now!